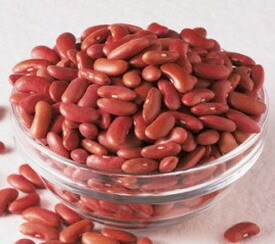 Many benefits that we can get from red kidney bean. Nutrient content in the red kidney bean are very good for the health of the human body. Beside for cooking into variety of delicious foods, red kidney bean nutrition also incredibly rich. kidney beans are rich in folic acid, calcium, complex carbohydrates, fiber, and protein is high. The content of complex carbohydrates and high in fiber which makes kidney bean can lower blood cholesterol levels. kidney bean glycemic index levels also are low, so it is good for people with diabetes and reduce the risk of diabetes. Red kidney beans are often used in a variety of dishes, especially rice, curries, salads and toppings. Dried red kidney beans usually cooked into porridge, soup or mixed vegetable, and ice. Kidney beans are also often cooked into a sweet jam is used as filler a few pastries, such as Steamed Bun, moon cake, moci, dorayaki cake, donuts content, and others. Kidney beans almost free of fat, sodium, cholesterol. Besides kidney bean are very low in calories (only 6 per cent per 100 grams), as well as cheap price. Even the kidney bean able to meet the 30 percent requirement of dietary fiber (fiber) and contains 168 mg of Omega-3 fatty acids and 107 mg Omega-6 fatty acids. The content of protein and amino acid profile in 100 grams of red beans (kidney bean) of the vast majority are glutamic acid (1323 mg), aspartic acid (1049 mg), leucine (693 mg), lysine (595 mg), arginine (537 mg) , serine (472 mg), phenylalanine (469 mg), valine (454 mg), isoleucine (383 mg), proline (368 mg), threonine (365 mg), alanine (364 mg), glycine (339 mg), and others 300 mg.
Nutritional vitamins in kidney bean include folate were able to meet the daily needs of 33 percent, 11 percent of thiamin, 10 percent of vitamin C, 6 percent of vitamin B6, and others remaining under 3 percent. Mineral content of red bean able to meet each of the 24 percent of the daily manganese, 16 percent of iron, 14 percent of the phosphorus, 12 percent of the potassium and copper, 11 percent of magnesium, 7 percent of the zinc, and others remaining under 3 percent. Dried Kidney beans are a source of complex carbohydrates, dietary fiber (fiber), vitamin B (especially folic acid and vitamin B6), phosphorus, manganese, iron, thiamin, and protein. Every 100 grams of dried kidney bean that have been boiled can provide 9 grams of protein or 17 percent of the daily protein adequacy. Kidney bean are also a good source of fiber. In 100 grams of dried kidney bean, can produce 4 grams of fiber consisting of water-soluble fiber and insoluble fiber. Water-soluble fiber significantly lower blood cholesterol and blood sugar levels. To reduce the content of toxin (lectin phytohaemagglutinin) and intestinal gas produced by oligosaccharides beans, there are several steps you can take. After kidney bean soaked, discard the soaking water, boiled with water in a saucepan lid for 2-3 minutes, then let stand for 2 hours. Discard the cooking water, add fresh water at room temperature until kidney bean completely submerged. After two hours, discard the water again and add more water and let it soaked overnight before it would actually cooked.